There are many ways to use The Thieves Oil Recipe. It is a highly versatile blend of oils that can be used for cleaning and for healthy immune support. Due to the various properties of this blend of essential oils, Thieves Oil can also help to alleviate minor aches and pains that you may experience with daily life. Our family uses Thieves Essential Oil for just about everything. It is safe for the environment plus it contains numerous health supporting properties and benefits. We have found that Thieves® essential oil supports our immune systems, especially during cold weather months. You can clean your home with Thieves Essential Oil, freshen the air, add fragrance, eliminate odors and support your family’s immune system all at the same time! This is truly amazing! The uses for Thieves Oil are almost endless. There are many creative ways you can use it for cleaning and disinfecting, and for maintaining family health naturally. You can make your own DIY Thieves Oil Recipes for family’s health, cleaning, personal care, etc. This Oil Blend is a true multi-tasker! We use this oil blend on all family members including our babies and children. Of course always dilute with a vegetable or carrier oil before using it on children and babies. Applying this oil to the bottom of the feet is highly effective. It is also the safest place to apply essential oils. I have included Thieves Oil Recipes for cleaning around the home, and Thieves Oil Recipes to support your family’s health and wellness. These suggestions are enough to get you started. Soon you will have your own creative and fun ways of using Thieves Oil. The sky's the limit! The Thieves® Oil Recipe was created by Gary Young in the early 1990’s during his study and research on Essential Oils. According to Gary, there are 17 different versions of the "Story of Thieves" or the story of "The Four Thieves” and each story contains a different list of oils. Intrigued by these different “Thieves Oil Recipes” he extensively researched the properties of each of the different oils. Choosing certain oils due to their chemical structure and immune supporting properties he created his own proprietary blend known as Young Living’s Thieves® Oil Blend. The thieves were actually spice traders and merchants who imported spices, including cinnamon and clove from India. When the Black Plague hit, all international shipping and trade was closed down. Unable to do business, these spice traders quickly ran out of money and had to find a way to support themselves. Since people in the communities were afraid to touch the dead bodies, they decided to loot the homes and bodies of the plaque victims. They would take clothes, jewelry, pots and pans, and then barter or trade them for food and money. They believed they wouldn't get sick if they rubbed vinegar, oils, and certain spices all over their bodies. When the King heard about the story of the thieves he wanted to know their secret recipe. He sent his Constables out to capture them. Four of the thieves were caught and brought before the King. He gave them a choice to either share their secret formula of "immunity" or be burned at the stake. The four thieves decided to share their secret formula with the King. The King immediately posted the thieves secret formula all over the town. Hence the story of the four thieves. There is an account of the Thieves Story recorded in the Royal English Archives. Diffusing Thieves Oil in your home helps to purify the air, eliminate odors, add a pleasant aroma, support your immune system, and support the healthy function of your lungs and sinuses. Thieves Oil has a pleasant cinnamon scent. Due to its ability to support healthy immune and respiratory function Thieves Essential Oil is very popular. There are many wonderful ways to use this highly health supporting recipe. If you make your own homemade recipe, please use only Therapeutic Grade Essential Oils, from a trustworthy source! Using essential oils from a trustworthy source is so important for your family's health and well being. Your skin is like a sponge and what you put on your skin will quickly enter into your bloodstream. Please note that 98% of the oils on the market are perfume grade and not Therapeutic Grade. They may contain dangerous toxins. Organic does not mean therapeutic grade. It can be organic and still be diluted…and many are. I personally found that disappointing fact out. Young Living Therapeutic Grade Essential Oils are the oils I recommend in the following homemade recipes. They are 100% Therapeutic Grade, pure, and safe for your family… and they work! Lemon essential oil contains properties that strongly support the health of your immune system. Lemon cleans, purifies, and has a fresh clean scent making it a refreshing and perfect all-natural household cleaner. *Note: One 15 ml bottle of essential oil contains approximately 285 drops and one 5 ml bottle contains approximately 85 drops. Store away from and sunlight. Preferably in a cool location. Keep out of reach of children. Here are some of the basic Thieves Oil Recipes and dilutions our family uses. You can experiment with these to come up with your own Thieves Oil Recipes. This is an all-purpose spray solution for cleaning around the home. 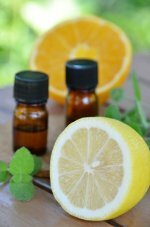 This Thieves Oil Recipe is great for cleaning the air and eliminating odors. 1 drop of thieves essential oil for each ounce of water, or for a stronger solution (my preference) 1 drop for every 1/2 ounce of water. Add the thieves oil first, then add water. It mixes better that way. Shake vigorously before each use. 1 drop of thieves oil to 4 drops carrier oil. Massage on the feet (vita flex points), lower back, neck and behind the ears. We use this dilution for everyone. Babies too, though usually just on their feet. Test for sensitivity first. If this should get too warm just rub carrier oil or V-6 on the spot. The neck is more sensitive than the back, chest and feet. *Note: This thieves oil recipe is excellent for daily use on the feet for healthy immune support or times when your immune system is stressed. Diffusing Thieves Oil will clean the air and eliminate odors. Different diffusers have different directions so follow yours. Diffuse 15-20 drops of Thieves Oil for 15 minutes three or four time a day in an essential oil diffuser. This can help clean the air while adding a nice fragrance. As your family breathes in the oils it will help to support healthy lung, sinus and respiratory functions. Washing your hands frequently with soap and water is good practice for stopping the spread of germs. 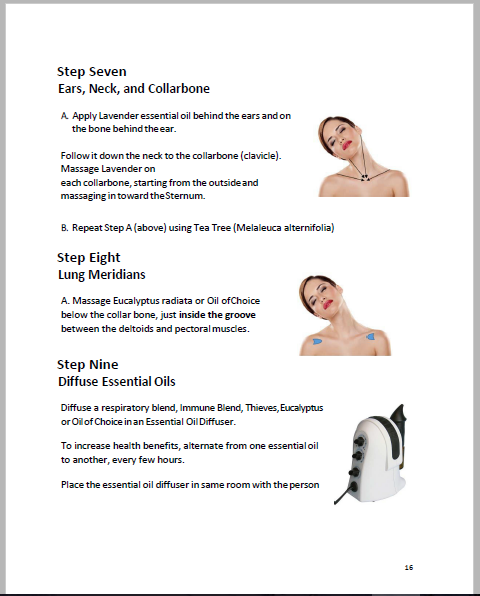 If our family wants additional immune support we run the diffuser continuously for a few hours. Diffusing helps give our immune system the support it needs to stay strong. I like to add a few drops of Lemon Essential Oil along with the Thieves Oil in the diffuser for extra support for healthy lung and sinus functions. Especially during the colder months. We also run the diffuser in the bedroom of anyone who we feel could benefit from extra support, while they sleep at night. This gets a continuous flow of the oils into the lungs and sinuses. It is highly supportive. Stuffed Animals- To clean, place toy inside pillowcase and tie shut. Fill washer with detergent, use fabric softener if desired. Add 5-10 drops of Thieves Essential Oil, (for small load) to washing machine. Wash on gentle cycle. Hair spray buildup, gum, gummy adhesive- Dilute 8 drops in 4 ounces of water, spray, let set for a few minutes before wiping. Cell phones- Spray thieves cleaning solution very lightly on a cloth and gently wipe phone. Dishwasher- Add 4-5 drops thieves oil to thoroughly clean dishes to eliminate build up and odors. Laundry- Add 5-6 drops per load to clean and deodorize. Pet Bedding- Spray down cat boxes, dog houses, and pet cages to clean and deodorize. Pet Dishes- Add 1-2 drops to soapy water and wash dishes. Rinse well. Plants- To repel aphids spray plants with a mixture of 2 drops thieves oil to every 4 ounces of water. Floors- Add 10-15 drops to ½ bucket of cleaning water. Surfaces- To clean and deodorize surfaces: add 8-16 drops to 8 oz. of water in spray bottle. Fragrance- Add a few drops to potpourri or cinnamon sticks to fragrance your home. Freshen and clean the air- Add several drops of oil onto a cotton ball and place in home, office, car, or hotel air vents to eliminate odor..
Freshen laundry- Drop 4–5 drops onto a cloth and place in clothes dryer. Bed Bugs- Spray mattresses to help dispel bed bugs. Children’s Toys- Add 4-5 drops to sink water with a few drops of dish soap and wash children's toys to clean. Dilute 15 drops with 15 drops of carrier oil. Massage over lungs, chest and back. Dilute 15 drops with 15 drops of carrier oil. Massage into lower back, on the upper back of thighs, and back of neck. *Note: When I get minor body aches, I massage Thieves undiluted or “neat” to my lower back, and on the top back of my thighs. Personally this works better for me. Some members of our family have sensitive skin, and Thieves Oil is too "hot" for them to apply undiluted, like I do on my back and thighs. Diluting thieves oil is the recommended way for use. Always test for sensitivity and have vegetable oil nearby to wipe off if necessary. To be clear none of the following recipes are intended to diagnose, treat, prevent, cure, or mitigate any illness or disease. These recipes may prove beneficial in supporting the body in healing itself. I firmly believe that it is the body that heals. I also highly recommend seeking professional medical care and advise when necessary. Dilute 1 drop of Thieves Oil to 4 drops of carrier oil and apply to lower back, sternum, chest and throat. Rub on “vita-flex” points. Apply to bite or sting to relieve minor pain. Add 1 drop of Thieves Oil to a bottle of water (not plastic) and drink during the day to support healthy immune system function, and to help support a clean digestive tract. Add 1 drop Thieves to a cup of warm water and drink as a tea, wait 15 minutes before eating, excellent for supporting a clean digestive system. Add 1 drop to orange juice, soy milk, apple juice, etc. to aid immune system. Place 1–3 drops in a size “00” capsule with 4-6 drops of vegetable oil and swallow daily to support your immune system and support longevity. or add 1 drop of thieves and 1 drop lemon essential oil in warm water, drink as tea. You can lick 1 drop off top of your hand and swallow or you can drop 1 drop directly on your tongue, swish around in mouth to mix with saliva, and swallow slowly. In a small spray bottle add 1 drop of Thieves Oil to 1 ounce of water. Shake well and spray on back of throat. Dilute 1 drop thieves oil to 4 drops of organic vegetable or carrier oil and apply. You can apply Thieves on gauze or band-aide and cover. Place a drop of Thieves Oil on your thumb and place on the roof of your mouth. This may require a few repeated applications. Be careful not to lick your lips as this can burn. Use vegetable or carrier oil to wipe off if you do. Place a few drops in a steaming bowl of hot water, cover head with towel and inhale vapors. Mix 2 drops of thieves and 2 drops of lavender, with 2 drops of vegetable or carrier oil. Apply undiluted to pimple. If skin is too sensitive dilute with vegetable oil. Put a drop of thieves on your toothbrush before brushing. Thieves Oil Recipe for Mouthwash: Add 1 drop per ounce of water, shake well before use. Toothpaste: Add 2 drops to 4 tbsp. of baking soda, place in small container (not plastic) and shake well. Dip toothbrush in mixture and brush. Freshen Breath: Drop directly on the tongue, or add to a spoonful of honey, Agave, or even on a piece of bread and swallow. There are so many ways to use it around your home and so many benefits for your families health and wellness. I'd love to hear your stories and different the ways you have discovered to use Thieves Oil. If you have something you'd like to share please leave a comment below. Back to Top "Thieves Oil Recipes"